It’s time that I stop parading around like some kind of salad hater. Every salad recipe I post comes with the disclaimer, “I usually am not a salad fan, but this one has me converted.” Reading through the chain of salad recipes on NCK, you may rightfully think it’s just some bad marketing ploy. But really, I have no personal investment in whether or not you make each salad, so it’s time to come clean: I could eat the right salad for any meal, any day, any time (and likely anywhere). 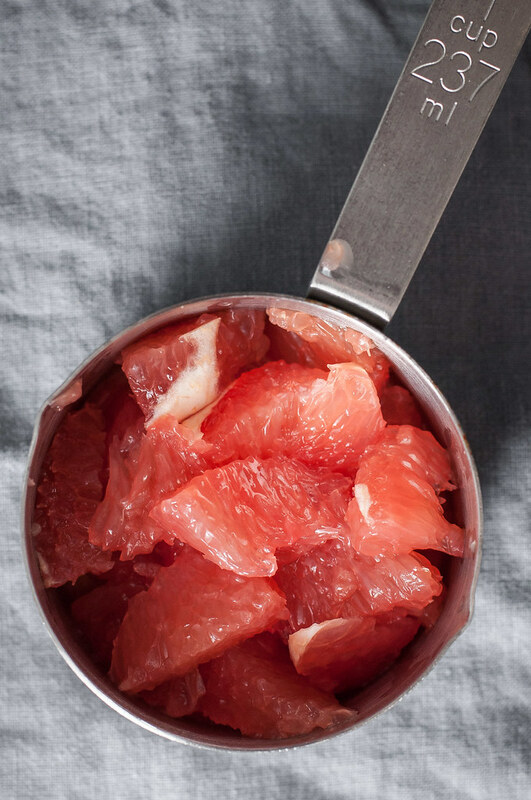 Grapefruit Greek salad is no exception. Or maybe all it takes for me to love salad is the right season. It’s spring (kind of), and for the first time, I’ve just posted two salad recipes practically in a row, in desperate need of freshness as we emerge from a winter of rich cheese and pasta-centric meals. Case in point: last night at dinner, to go with my first Julia Child recipe for spaghetti (more pasta) Marco Polo, I prepared Heidi’s cauliflower salad. Steve all but sneered at the strange ingredient combo I had going on the cutting board–blanched cauliflower, capers, apples–but was quickly convinced that, although lacking in color, this cauliflower masterpiece belongs on permanent dinner rotation. 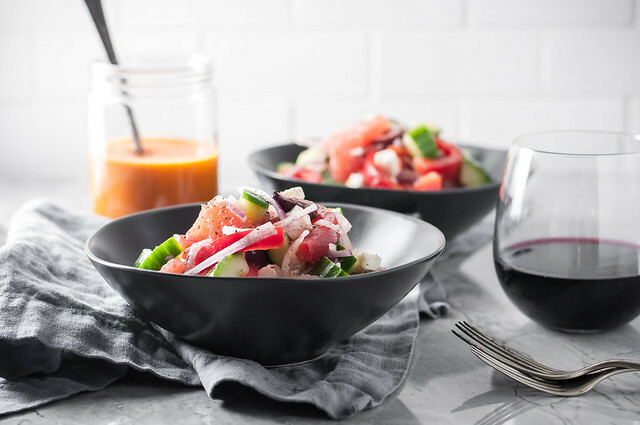 The best part about grapefruit Greek salad, unlike its summer tomato-laden counterpart, is that it works year round, particularly in late winter, when you’ve been loading up on cheesy hot dish for weeks, and grapefruit happens to be in peak season. 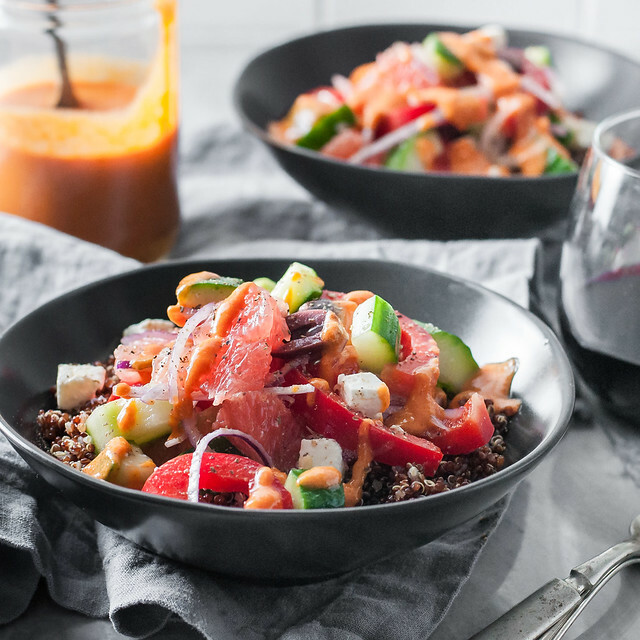 Like tomatoes, pretty pastel grapefruit chunks are sweet, juicy, and acidic, a great balance to lots of crisp veggies and another non-traditional aspect of this salad, the creamy sun dried tomato dressing. Just in case you really miss the tomatoes, I packed the quick blended dressing with jarred sun dried tomatoes, a pantry staple for any Mediterranean food lover (i.e., me). Finally, as if big chunks of feta in the salad weren’t enough, I managed to sneak in a little extra by way of the dressing. Because it’s probably best to wean off all that rich winter cheese consumption slowly. In a blender, puree lemon juice (or vinegar), ¼ cup olive oil, maple syrup, 2 tablespoons water, oregano, feta, salt, and plenty of pepper. With blender running, drizzle in remaining ¼ cup oil. Thin with an extra tablespoon or two of water, as desired (I added one tablespoon), and adjust seasoning to taste. Refrigerate until needed. Before serving, allow to rest at room temperature, as the dressing may begin to solidify in the fridge. In a mixing bowl, toss cucumber, red onion, bell pepper, olives, the olive oil, and a pinch of salt. Add grapefruit and feta and mix gently (with your hands or two utensils) until just combined, being careful not to break up the feta cubes too much. 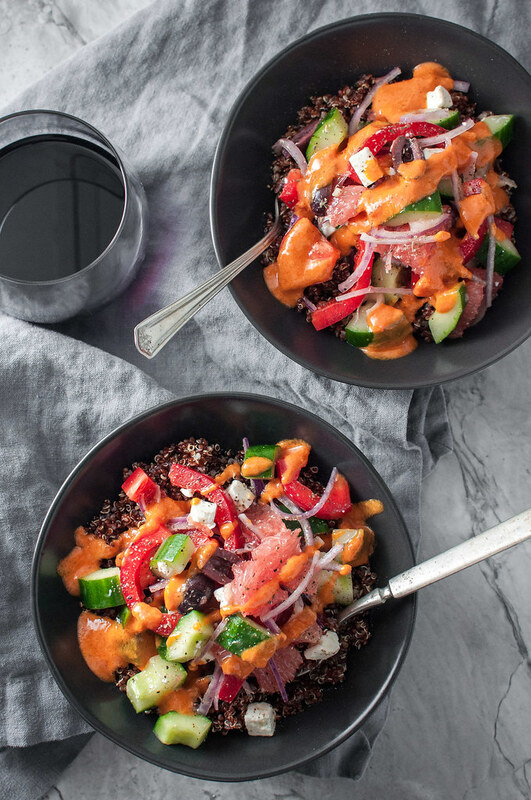 Serve alone or over quinoa, drizzled generously with the dressing, and sprinkled with a bit of dried oregano and black pepper. Quinoa, if using, will cook in about the time it takes to prepare the entire salad. Toss warm quinoa with a little good olive oil, salt, and pepper.